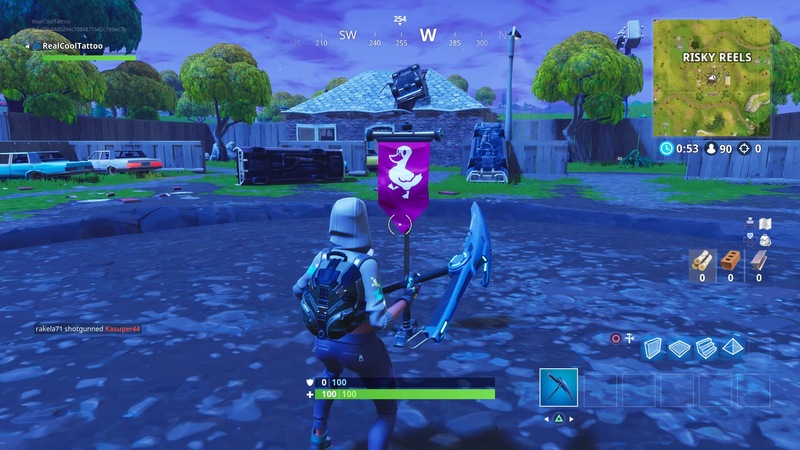 Ready for a walking tour of the whole Fortnite map? Your challenge this week is to visit the center of Named Locations in a single match. It’s not as easy as it sounds, but we’re here to help. You’ve only got a few more days before the start of Fortnite Season 5, so get this done while you can! You’ll have to visit four of these in a single game to complete the challenge. To find the centre, you’re looking for a white glowing pole. Once you go near it, it’ll raise a flag that matches your emblem. In terms of strategy, you want to stick towards less popular landing spots. This means places like Tilted and Risky Reels might not be the best place to go straight away. You want the competition to be thin by the time you reach the more populated areas, so try to land somewhere out of the way like Flush Factory, Snobby or Lonely Lodge. That way you’ll be able to tick off a couple of centres before you even run into anyone else. If a whole new set of challenges isn’t fun enough, we’ve also had confirmation that Fortnite Season 5 will start in the second week of July. For help with the rest of the week 9 challenges in Season 4, take a look at our full page.